Answer: The "Chinese Evergreen" or Aglaonema are cold sensitive and should be grown in protected areas if used in any outdoor landscape (which is very rarely). The primary production of Aglaonema's as a group is for use indoors as houseplants where they can enjoy the same temperatures you do year-round. Thousands of Aglaonema's are grown today for indoor use. They are available in most garden centers, grocery stores and nurseries that carry indoor houseplants. Although some varieties of Aglaonemas may only be found in some of the high-end garden centers and nurseries or by placing a special order with your favorite greenhouse. Some of the newer varieties or extreme slow growers like "Aglaonema costatum" are available in limited numbers and are generally purchased in smaller quantities by interior plantscapers. 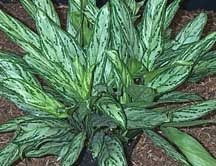 The Chinese evergreen has become one of the most versatile, recognizable and widely used group of plants for indoor use. "Silver Queen" and "Emerald Beauty" have been one of the cornerstone plants for indoor use by the professional interior plantscaper for decades. With the many new varieties becoming available you can only expect the indoor gems to find more use in the indoor landscape. I know you're wondering... Is it possible that you can have the same plant, indoors, for years? It's possible... by having the right information and applying it... you can enjoy your chinese evergeen for decades. Some of our Plant Care subscribers have been growing the same plant indoors for over 20 years.